PLEASE KEEP A VERY CLOSE EYE ON YOUR CHILDREN (AND YOURSELVES) AROUND THE CLIFFS, AS THEY ARE PRONE TO COLLAPSE. THE MUD IN PARTICULAR IS VOLATILE AT THE MINUTE AS CAN BE SEEN BY THE RECENT SLIPS AND RIVERS RUNNING THROUGH IT. PLEASE ALSO BE AWARE OF THE TIDES - THIS CACHE SHOULD ONLY BE ATTEMPTED AT LOW AND OUTGOING TIDE. DO NOT CLIMB ON THE CLIFFS UNDER ANY CIRCUMSTANCES AND STAY AWAY FROM THEIR BASE. UPDATE 16 NOV 15 - ROCK SHOWERS HAVE BEEN NOTED FALLING FROM THE CLIFFS, PLEASE DO NOT VENTURE NEAR THEM. YOU DO NOT HAVE TO GO NEAR THEM TO COMPLETE THE CACHE. THIS CACHE IS AN EARTHCACHE AND THERE IS NO PHYSICAL CONTAINER. PLEASE DO NOT LOOK FOR ONE. 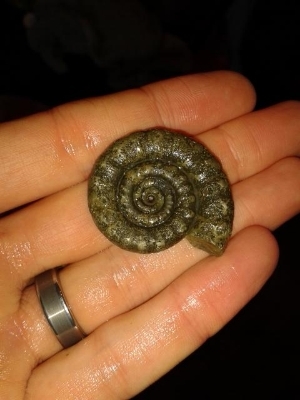 The aim of this cache is to point out the cliffs of Black Ven between Charmouth and Lyme Regis, and the importance of what they contain, namely fossils! The cliffs are made up of many layers, with the bottom being predominantly blue lias (lots of mud and clay) with beef shales above, followed by the black ven marls, belemite marls and finally gault and upper greensand. 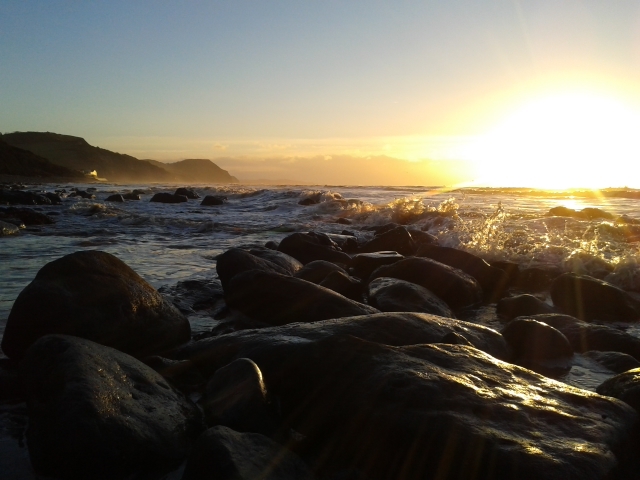 The blue lias layer comes to and end in-between Lyme Regis and Charmouth. Clays and mud from the cliffs are constantly moving and falling due to water acting as a lubricant between the different layers. 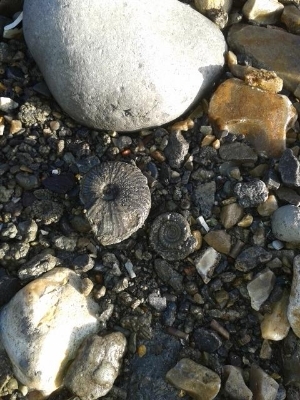 This gives rise to the large amount of fossils than can be found in this section of the beach. Again, please make sure you are well aware of this when on the beach and always keep an eye on the cliffs. 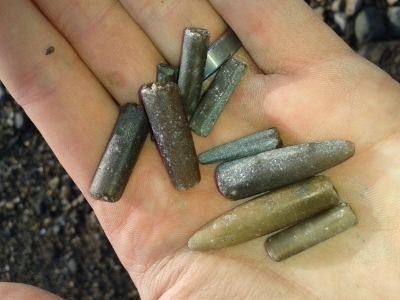 Fossils are often found in amongst the iron pyrite at the base of the cliff where this cache is located. The iron pyrite can be seen as a dull and rounded brown rocks, and occasionally in the bright shiny fools gold which you may be expecting. These beds lie between boulders, and are a good place to find belemites and ammonites. 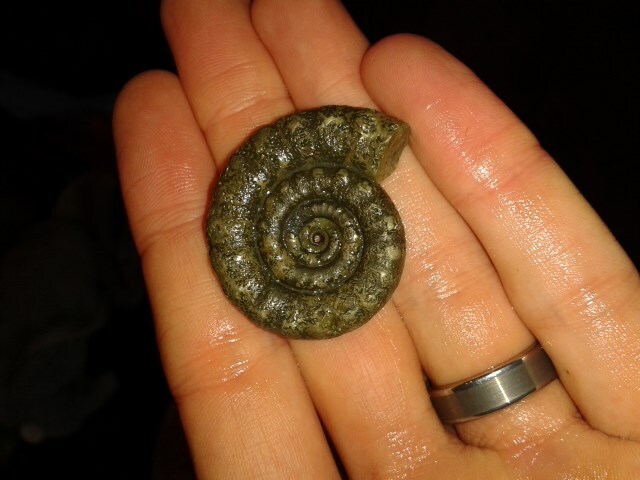 For a real insight into the fossils a trip into the Heritage Coast Centre is highly recommended, as are their fossil walks. 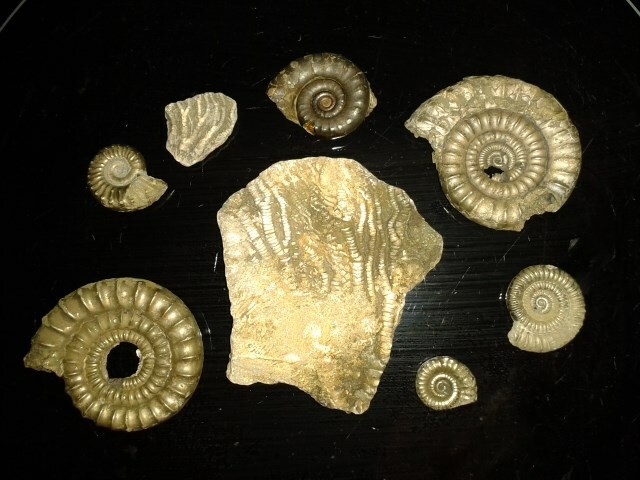 For a brief description of the fossils that can be found; the ammonites are curly, belemites like bullets, crinoids shaped like long stars and vertebrae like black donuts! A full icthyosaur skeleton was found on the beach on boxing day, 2013 proving that the big ones are still there! 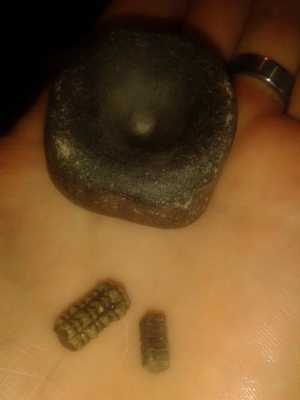 Some images of fossils we’ve found are below. 1. At the cache site there is a big landslide which sticks out into the beach. Is the landslide made up of just one material or is there more to it than first appears? 2. Near the co-ordinates there are layers of ‘beef’ rock. What features make them look like beef? 3. What are the average size of the iron pyrite lumps? Describe the texture of the pyrite. 4. Optional: Take a photo of you/your GPS/fossils you find and post it with your log. I don't mind you logging the cache before you email me the answers, but if no answers are emailed the log will be deleted. Lots of photos are appreciated! Placed with kind permission from Natural England. 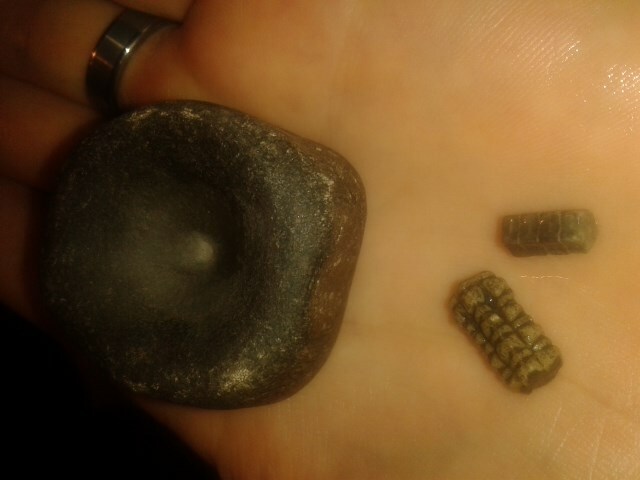 More Ammonites and Crinoid PlateAll picked up from the beach!